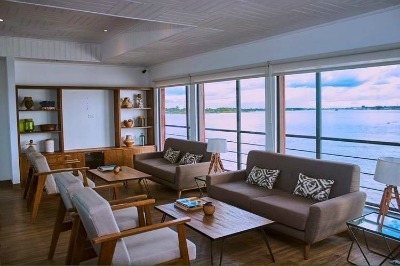 La Perla is a moderately-priced boat conceived with the comfort in mind of a traveler who wants to enter the heart of the Amazon jungle, arriving at virgin spots that possess their own magic. Its small draft allows to visit places that are difficult to access and where not all the boats can navigate. Auxiliary boats with outboard motor are the ideal complement to reach the most remote areas of the Amazon, allowing you to navigate to lagoons, narrow canals, streams, and flooded forests. 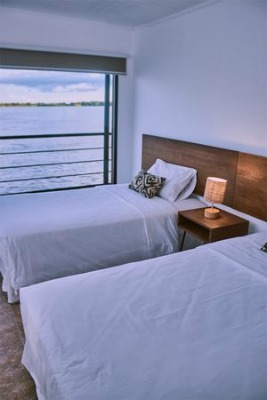 ​Rest and relaxation also have their space aboard La Perla. Its outdoor hammock area is a privileged space from which to enjoy the Amazonian breeze while contemplating the sunset or where to recharge your batteries after an excursion to the confines of the jungle. 08:30hrs Meet and greet at Iquitos Airport by staff. 10:00hrs Proceed on a 1.5-hours bus transfer to private pier at Nauta, where We will get on board. Brief orientation about the journey. while the ship starts sailing down the Marañon River to the confluence of Marañon and Ucayali River where the Amazon River starts. 15:30hrs Boat excursion looking for wildlife into the communal reserve of Yanayacu of Yacapana. You will appreciate Giant water lilies, birds, iguanas, sloth, the beautiful pink dolphins and much more. 06:00hrs Early wake up call. 06:30hrs Birdwatching excursion into the yanayacu of Yacapana communal reserve, on this morning we will see macaws, sloth, monkeys, toucans, fly catchers, trogons, parakeets and more. 08:00hrs Breakfast on Board. We turned to sail up The Amazon River to Ucayali River. 12:30hrs Lunch on main boat. 15:00hrs Geographical orientation and short talk about the amazon by the naturalist on board. 16:30hrs Visit to the butterfly farm project of Vista Alegre Communal Reserve. On this afternoon, we will learn about the butterflies from the amazon and the importance of them in the rainforest. 18:00hrs Back to the ship. 06:30hrs get ready to go into The Black Yarapa River to The Amazon natural Park where the suspension bridges and viewing platform with canopy walkways are located. We will have the experience of being up on the bridges searching for wildlife and enjoying of the spectacular view of the forest. 08:00hrs Breakfast on board. We keep sailing down the Ucayali way to the confluence and up the Maranon River. 15:30hrs Jungle walks in a Casual Communal reserve; we will learn about medicinal plants search for insects, tarantulas, frogs and learn basic survival in the forest with our expert naturalists. The early morning offers another opportunity to watch the world awakening in the rainforest. Perhaps you will spy iguanas, river turtles, cormorants, or wattle jacana during this excursion. We return to our riverboat. 9:30 hrs After breakfast we will prepare to meet a local Indian family. They will welcome us into their home to share conversation over the midday meal, introducing you to their culture, costumes, and way of life. This is a rare and unforgettable opportunity to gain new insight into a world truly apart from our own. The ship starts sailing down the Marañon River to the confluence of Marañon and Ucayali River where the Amazon River starts. Afterwards, we will walk along the shores of the Ucayali River, located in the Yucuruchi region of the Amazon. Here we will have an opportunity to see the Victoria Regias, water lily a gigantic aquatic plant. 11:30hrs Back to the ship and swimming with the pink dolphins. 16:00hrs Shaman Ceremony in San Regis. We will get deep into our former believes and learn some of our ancients secrets of the rainforest. 18:00hrs Reception with Live Music on board. 21:00hrs Night Boat ride in the jungle of nauta creek into the Pacaya Samiria National Reserve. 19:30hrs Farewell dinner on board while the ship sails down to Nauta town. 09:30hrs Visit the Manatee Rescue Center en route to Iquitos. 10:30hrs Small city tour around Iquitos to see the famous houses dating from the rubber time era, such as Iron House, Belen Market and more. • Transfer Iquitos Airport/ Nauta/Iquitos Airport. 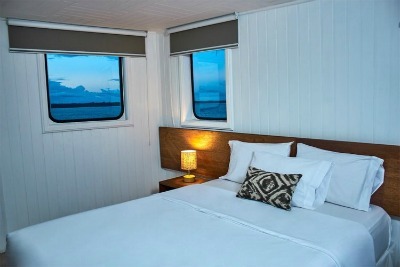 • Overnight aboard the M/V La Perla Cruise. • Bottled water and non-alcoholic house beverages. • English & Spanish-speaking interpreter service. • Open boat guided excursions. • Canopy walk through Amazon Natural Park. • Entrance fees to Amazon Natural Park & Pacaya Samiria Natural Reserve. • Domestic airfare and local airport taxes. • Alcoholic and bottled beverages. * Cost of medical emergencies (including evacuation). • Tips - Tipping guidelines. 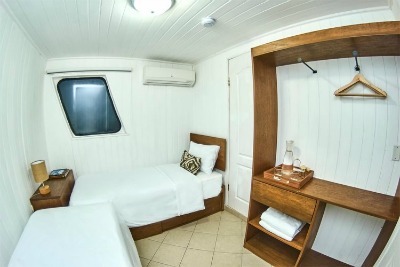 We recommend an amount in the range of US$10 per passenger per night for the crew (to be divided among all the crew members) and between US$5 per passenger per night for the guides. NOTE: The proposed routes for the cruise may vary depending on the type of weather, the season that regulate the level of water of the rivers, as well as the wildlife cycles. Visits to the towns depend on the availability of the communities. However, the plan is to arrange the visits to avoid a negative effect to their cultural identity. 09:30hrs Visit the Manatee Rescue Center en route to Nauta. The guides will be expecting your arrival at the airport with a sign for your transfer to Nauta to board the cruise M/V La Perla. As you enter into your cabin, which will be full equipped with everything you need, you will feel how this lifetime trip is about to start. The navigation will initiate in the Marañon River to the confluences of the Marañon and Ucayali rivers where the majestic Amazon begins. We suggest to take a time to go to the observation deck and enjoy the amazing panoramic view, the guides will be explaining the story of the Amazon’s origin. After getting familiar with your new environment, you will be invited to the dining room for lunch, where you will experiment our exquisite regional gastronomy, a delicious flavor celebration. Later, our guides will provide a general briefing about the trip itinerary, activities, routes, wildlife and vegetation. Our guides will be attentive to help you with any question you might have. After lunch, you will visit the Samiria Reserve to observe the Charapas turtles. Later at night, an excursion will be offered for searching wildlife in the Amazon. Back to the ship our naturalist guides will share more information and enrich the experiences of the day. You will be able to enjoy the local music followed by an exquisite dinner. This morning, you will explore Yanayacu de Pucate and enjoy a picnic breakfast in the Pacaya Samiria Natural Reserve accompanied by nature. Some pink dolphins might enrich the panorama. Also, it’s possible to observe blue and yellow macaws, toucans and different types of monkeys. You will have a canopy walk where we will look for wildlife and enjoy the breathtaking view. After lunch on board a ceremony will be held with shamans in St. Regis will take place, where you will learn about the ancient secrets of the rainforest. Later, you will be part of the tree planting ceremony. Before dinner, a reception with live music will be held by the ship band. In the warm night, you can be part of the boat ride through Nauta Creek within Pacaya Samiria Natural Reserve which is known as the mirrored forest, which makes perfect sense as you gaze upon its glistening black water where you can observe lizards, frogs and different kinds of nocturnal animals. After a delicious breakfast, we head for the black water stream of San José de Zarapanga called Shiriyacu to fish piranhas, using traditional and local techniques, you will be surprised by the many ways there is to fish. We will visit Kukama Prado village to learn about ancient traditions and medicine used by the ancestors; in the Peruvian Amazon are different types of traditional medicine that maybe you have not heard before. Then, you will be part of a cooking demonstration, where you can learn about local techniques and the variety of vegetables and dishes that exists in the Peruvian Amazon. In the afternoon, a boat excursion will be offer before sunset in the Amazon River, where we can hear the sounds of wildlife, colors and symphony. At the same time, we will look for caymans, frogs, tarantulas, snakes and anacondas. After dinner, our naturalist guides will introduce the crew members whom you may not have met, as they have been busy “behind the scenes” to create your seamless Jungle Experience. After enjoying your last breakfast on board. We will proceed with the transfer by bus from the city of Nauta to Iquitos. We will have a stop in the Rescue Center Amazon - Manatee (ACOBIA), where you will be able to see and feed this beautiful animal. Then, you will have a brief visit to the city of Iquitos to observe the famous houses of the rubber boom, Fierro’s house, and Belen market. Single Supplement is 50% in addition to the adult rate. Child policy: 7 years old mínimum on all departure. Children aged 11 or under are elegible for a 50% discount from the adult rate. Children must be accompanied for one or two adults in the same cabin, maximun one child per cabin adult rate. ● Reservations made 91 days or more prior to departure: A deposit of USD$ 300.00 per person is required to confirm the booking. ● The final balance is required 90 days prior to the departure day. If payment is not received on time, the reservation(s) will be automatically released. ● Reservations made 90 days or less prior to departure: A full and non-refundable payment is required to confirm the booking. ● Cancellations made 121 days or more prior to departure: The deposit will be refunded, less USD$ 100.00 administrative fee per person. ● Cancellations made 120 to 91 days prior to departure: Deposits are non-refundable.